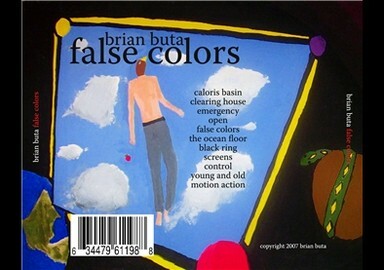 On his first full-length solo album, Brian Buta expands on the sound of FasterFasterHarderHarder, the band he formed over two years ago, pushing post-punk to the rear while electronic experimentation drives forth with rhythmic bass, textured synths (try the title track, "False Colors"), and near-new wave vocals on False Colors. "Black Ring" introduces itself with long synthesizer notes, keyboards, and a submariner bass line. The multiple layers throughout the album add depth to the shifting ambience throughout, as the songs move from the dark and ominous to the bright and shining ("Screens"). The straight, hardline beat of "Caloris Basin" meets well with the new-wave punk "Emergency". 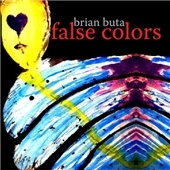 False Colors is most intriguing as it is entirely a solo project, all instruments being played, vocals being sung, recorded/mixed/mastered by Brian Buta himself. Down to the artwork, this is handmade by a musical being. I'm led to wonder if he put each jewel-case together by hand in an effort to retain absolute quality control over his creation. An artist to the core, Brian Buta makes it clear with False Colors that he is an incredibly creative soul. Listen to "Open" for the ascendancy and "Motion Action" which closes out a one-man show with fuzzy guitars and a vocal hook that will stay with you for hours. Brian Buta is a guitarist and vocalist from Baltimore. At age 13, he began writing music immediately after learning a few guitar chords. In high school and college, Brian played in numerous punk and modern rock bands, and expanded his recording know-how to use multi-track tape machines. In 2005, Brian founded the Baltimore indie rock band FFHH and simultaneously began exploring digital recording. He released his first full-length solo album, False Colors, to glowing reviews in the fall of 2007. In winter 2008, he released his second full-length album, entitled Paper Ghosts. Brian continues to hone his skill as a guitarist, a performer, a songwriter, and an amateur recording engineer. Typical set is 10-12 songs, mostly originals with each song about 3-4 minutes in length. Past covers include songs by Nine Inch Nails, Smashing Pumpkins, and The Beatles.